The University of New Brunswick’s faculty of engineering is hosting its second annual Engineering Design Symposium (#UNBEngDesign) on Thursday, March 31, 2016 at the Fredericton Convention Centre from 8:20 am to 5 pm. The symposium, one of the faculty’s premier annual events, will showcase the designs of 300 final-year engineering students in all disciplinary capstone design courses. This year, local governments, companies, or non-profit organizations are sponsoring approximately half of the projects. Eddy Campbell, UNB’s president, is looking forward to seeing the student’s work first-hand and hopes that the event draws a big crowd. “This will be an excellent opportunity for everyone to see the impact experiential learning at UNB is having on our students and the community for which they are serving as part of their course work,” said Dr. Campbell. 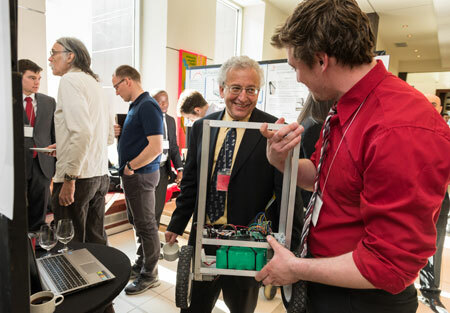 Chris Diduch, UNB’s dean of engineering is encouraging the UNB community—particularly early-year engineering students—to come see what their fellow-students have been working on throughout their degree. “The symposium can provide a framework for the aspirations of new students when they reach their final year of study,” said Dr. Diduch. To make it easier for students to attend, the faculty of engineering has hired a bus to bring students and staff to and from the Fredericton Convention Centre. Busses will pick students up at the main entrance of Head Hall every half hour on the half hour. The symposium is open to the public from 8:20 am to 5 pm on March 31 and all are encouraged to stop by. For more information, contact Heather Jones.